In recent years proteins within cells have been identified that are directly related to particular diseases, e.g. cancer. Many of these proteins can be visualized with immunocytochemical marker stains. 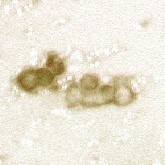 For example cells infected by a virus can be visualized by attaching a stain to antibodies which in turn bind to a specific upregulated protein after virus infection. The antibody, docked to the affected cell, is stained by a chromogene which then can be identified in a microscopic inspection. Human papilloma viruses (HPV), e.g., are responsible for almost all cervical cancers, and the infection can be detected with the specific p16-antibody in cervical brush smears with high sensitivity. 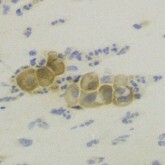 A PAP smear, stained with a counter stain (hematoxylin, blue) and the p16-antibody (brown). An immunocytological investigation can therefore non-invasively identify high risk patients for this type of cancer. The automated scanning of slides followed by computer aided detection of marker-positive cells will help physicians to cope with the high load of specimens in a screening scenario and to reach a more reliable diagnostic result. 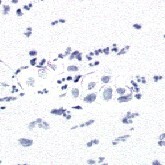 A newly developed virtual destaining of immunocytological specimens reveals the seperation between the immunocytochemical marker stain (brown) and the counter stain (blue). Improving Specificity of Immunocytochemical Marker Detection via 40x Magnified Microscopic Images. Detection of stained vaginal mucus to reduce artifacts in immunocytochemical pre-screening. Development of detection algorithms for immunocytochemical markers in microscopy images. The project was supported by the excellence initiative of the German federal and state governments.